As a parent, you are probably concerned about whether your child is hitting developmental milestones. Knowing what gross motor skills are and examples of how children display them can reassure you as to their progress. You'll be able to better report these skills to your pediatrician so your child's development can be followed. Essentially, gross motor skills are actions that utilize the body's gross, or large, muscles, such as those in the arms, legs, and core. As a result, sometimes gross motor skills are referred to as large motor skills. 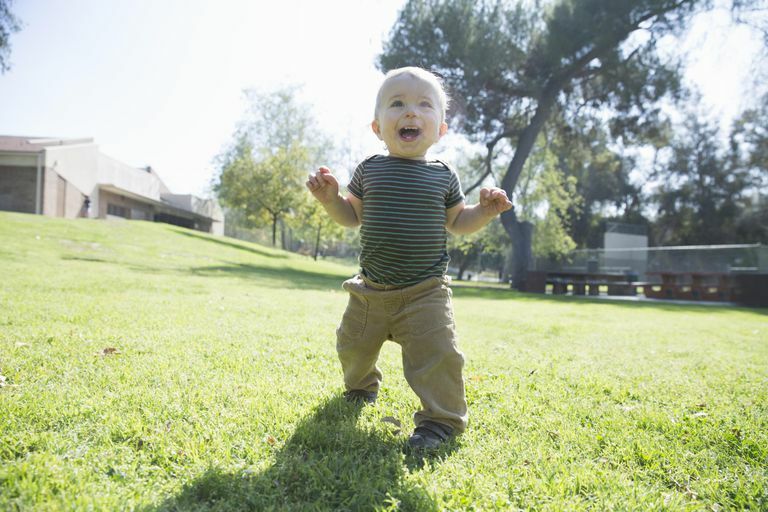 Children who are about a year old can already perform a variety of gross motor skills, including crawling, pulling themselves up to stand, traversing furniture, or walking and waving. While even small children can execute such tasks, coordination between the upper and lower body is not very developed at this point. As a child approaches 2 years of age, gross motor skills expand to include tasks such as bending over to pick up a toy, running, climbing steps, and kicking or throwing a ball. As the parent of a toddler, you may notice a dramatic shift in your child's gross motor skills in just one year. "At first he could barely walk, and now he's running all over the place," you might observe. Once children near 3 or 4 years old, they begin to master complex gross motor skills such as jumping (both in place and forward) or balancing on one foot. Their ability to climb stairs and throw balls show marked improvements as well. You can encourage your child's development in this area by offering plenty of opportunities to practice. Regularly plan outdoor physical activities, such as sandbox play, scavenger hunts, or yard work. You can also encourage indoor activities such as yoga, hide-and-seek, or obstacle courses. Purchase a set of small balls or a basketball hoop. Then, show your child how to use them and allow him to play with them freely. Parents must take care to avoid unwittingly behaving in ways that might hinder a child's gross motor skills development. For instance, some parents frequently carry their children or place them in strollers. To facilitate the development of gross motor skills, you should instead work on letting your children practice their walking skills. You can take them out of the stroller for a while, allowing your children to hold onto the side for balance. Then, when it's time to cross the street or children grow tired, you can place them back inside of the stroller. Observing gross motor skills is a great way you to see if your toddler or preschooler is hitting appropriate developmental milestones. That said, not all children develop at the same pace. Some will develop certain skills sooner than others. But if you suspect your child has a developmental delay, don't hesitate to consult your pediatrician. Report how your child is progressing so you can work together to spot any delays or be reassured that they are on track.